The Automated Clearing House (ACH) is an electronic payment network used by individuals, businesses, financial institutions, and government organizations. Electronic ACH payments provide better cash management capabilities and lower costs than traditional paper payments. It is a highly reliable and efficient nationwide batch-oriented electronic funds transfer system which provide for the interbank clearing of electronic payments for participating depository financial institutions. The ACH network allows funds to be electronically debited or credited to a company's or individual's deposit account. ACH Transaction Types Direct Deposit of payroll, Social Security and other government benefits, and tax refunds Direct Payment (or direct-debits) of consumer bills such as loans, utility bills and insurance premiums Business-to-business payments Electronic Checks (E-checks) E-commerce payments Federal, state and local tax payments. 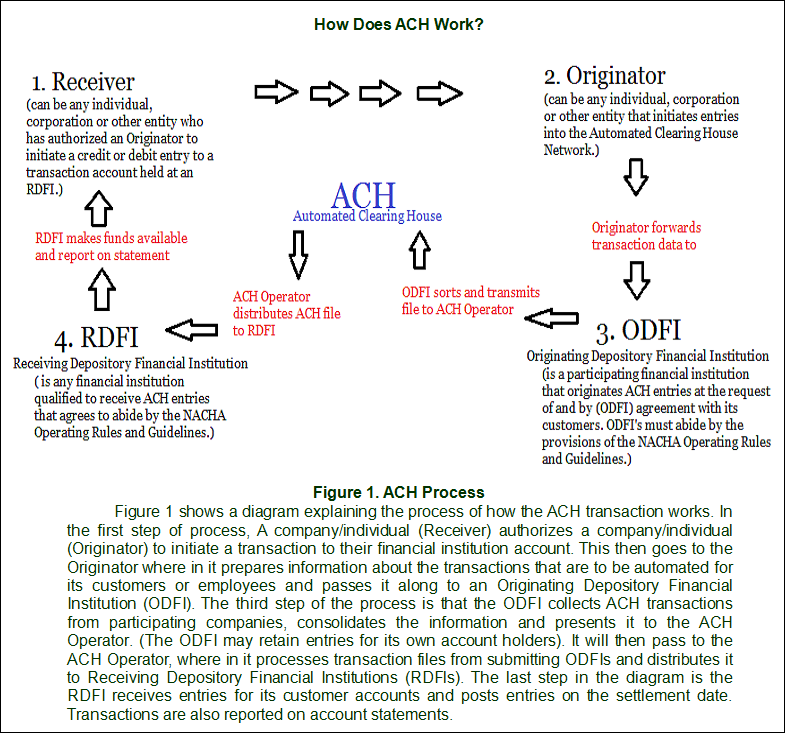 ACH Participants Typically, five participants are involved in an ACH transaction: (a) the originating company or individual (Originator), (b) the Originating Depository Financial Institution (ODFI), (c) the ACH Operator, (d) the Receiving Depository Financial Institution (RDFI), and (e) the receiving company, employee or customer (Receiver). How Do Companies Benefit From ACH Applications? Direct Deposit Eliminates critical delivery of checks since funds are automatically deposited. Eliminates special checks for employees away from work or on vacation. Minimizes storage and security of check stock. Reduces employee time lost due to personal banking business on payday. Additional employee benefit for little or no cost. Direct Payment Check handling and manual payment processing are eliminated. Allows businesses to offer additional customer payment service. Eliminates erroneous checks (i.e., no signature or wrong amount). Reduces the possibility of insufficient funds. Cash flow forecasting and funds management are improved. Provides next-day funds availability from outlying locations. Provides the conveniences of automated transactions. Reduces the need for expensive wire transfers. Corporate Payments Assures payment discounts for predetermined payment dates. Reduces internal processing costs. Reduce bank service charges Improve vendor relationships as a result of more timely payments Re-presented Check Entries Faster notice of returned re-presented check entries via the ACH. Ability to transmit entries on specified dates. Improved collection rate on returned checks. Lower costs. Point-of-Purchase Entries Faster collection of funds, Lower costs. Faster notification of returned entries. Benefits to Corporate Originators Cost reduction. The reduction of paper handling, which comes from automation. Benefits to Originating Depository Financial Institutions Reduction in processing costs Stronger customer relationships. Revenue generation Benefits to Receiving Depository Financial Institutions Reduced costs in processing incoming entries. Immediate collected funds for credit entries. Improved customer service Benefits to Receivers Increased control over account balances. Reduced payment costs. Convenience of use. 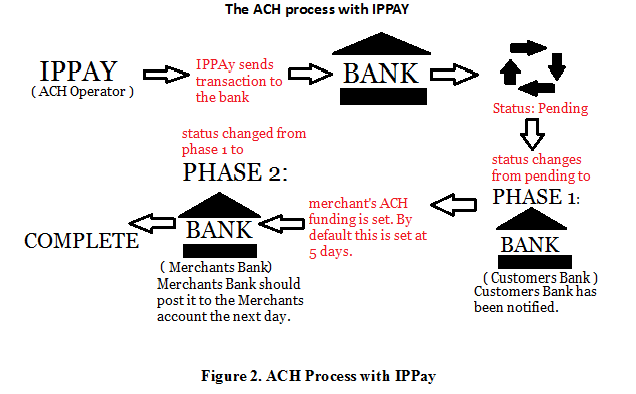 This diagram shows the process of ACH transaction with IPPay, when IPPay receives an ACH transaction on or before 2:30 pm CST. Click on image for larger view. For our purpose, we always submit ACH autobills around 4 am, so our ACH autobills would get processed same day at 2:30pm. IPPay sends it to their bank at 2:30 pm CST. The transaction status changes from Pending to Phase 1. In Phase 1, the customer's bank has been notified. The customer can see the debit appear on his/her statement as early as this same day. Now depending on how the merchant's ACH funding delay is set to, they will get their money. By default, this is set at 5 days. This is the time they wait for the transaction to reject or not before they pay the merchant. At this time, the status changes from Phase 1 to Phase 2. In Phase 2, the merchant's bank should post it to the merchant's account the next day. Then the status will change from Phase 2 to Complete. This does not include weekends and holidays -- only business days. If an ACH transaction is received after 2:30 pm CST, it will be sent the next business day.